Blood and guts are part of being a paramedic….Once a paramedic, always a paramedic….And I was a paramedic….so when I saw “Red: The True Story of Blood” by Tanya Lloyd Kyi (Annick Press, 2012) I knew I had to read it. It didn’t disappoint. From sociological, religious, psychological, medical as well as physiological angles, “Red” addresses the history of blood throughout the world. 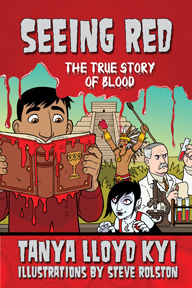 In a youth-friendly red-and-black style, “Red” uses anecdotes, from history and science along with clever comic-strip style to examine blood. While there is some graphic content, the topic of blood is tastefully addressed throughout the book. There are controversial subjects touched upon, including AIDS, transubstantiation (the term itself is not used in the book), gangs and ritual human sacrifice, so this book isn’t for young children. Read in proper context with good adult guidance, there are vast seeds for discussion and further study.